So when I began scribbling about Caribbean rhetoric, one of the impulses was to think of it in relation (or contrast) to Greek precedents. Understandable, I figured. It helped me focus early on, especially in those areas of differentiation–that is, what makes Caribbean rhetoric Caribbean as opposed to being just a substitution of Greek terms for Caribbean ones. (I discuss that at length in Tropic Tendencies, as well as the ways what we do on a vernacular level constitutes rhetorical activity at its most complex.) The flipside to such differentiation is the all-too-obvious similarity–the kind of similarity that works so well it could pass for substitution. But what can you do? Once you recognize that rhetoric is social activity, and that social activity is common to all people, it’s kinda pointless to deny that there are gonna be areas of overlap. Tropes, themes, concepts, and logics all have their corollary because they all have us as their common denominator. Now, this isn’t an essay or a lecture, but here’s an example of what I mean. In the application of classical rhetorical concepts, a major one is that of the Agorá (Ἀγορά)–a public place, a marketplace where people congregate to buy, sell, share, gossip, learn. The agorá shapes social interactions in the simplest way possible: it provides a space for those interactions to occur. It contextualizes. Like a yard or a marketplace in town. No rhetoric lesson necessary. You see where I’m going with this. This photograph of a Grenadian agorá was taken by attorney Arlene M. Roberts (@arlenemroberts) when she visited St. Georges for a weekend–she wanted to go teach for a year following a call for volunteers. I won’t go into Arlene’s story because it’s hers to tell. It’s pretty amazing, though. I hope she tells it soon. Anyway, she started following me on Twitter (@drbrowne) after finding me live-tweeting panels from the Caribbean Studies Association conference earlier this month (#csa2013). –that comprise the scene. Taken less than a year after the Revolution’s failure and the US “intervasion” on October 25, 1983, it is an exemplary text–a staging point, if you like–for extending the scope of a personal digital archiving project as a contemporary recuperative practice in Caribbean rhetoric. What does this mean? Well, to begin with, it enables us–those of us interested in the exploration, preservation of, and reflection on the everyday lives of our ancestors, our elders, and ourselves–to ask questions that could actually yield answers. We are in need of answers. Like I said, this isn’t a lecture or an essay, but I do have another example. A common refrain during the conference was that many of the Grenadian youth have no idea that a revolution even occurred–far fewer understand their place in the legacy of leftist thought in the region. 1983 was 30 years ago, after all. The unraveling in Guyana in 1953 was 60 years. That’s a whole lifetime, isn’t it? Nowadays, as the story goes, it might as well be ancient history for people caught up this “fast-paced, globalized world.” And this may be the problem: that the past is viewed as history, and history is viewed synonymously as something that happened a long time ago, ended when it did, and has no bearing on our lives today. We know that’s not true–that history doesn’t matter–but we also know there’s a big difference between knowing something and acting on what is known. The problem may be that the context has gotten lost. I could be wrong that this is the problem, or part of the problem, but it does allow us to ask other questions about context itself, questions that may allow us to reclaim it and reframe it for our purpose. 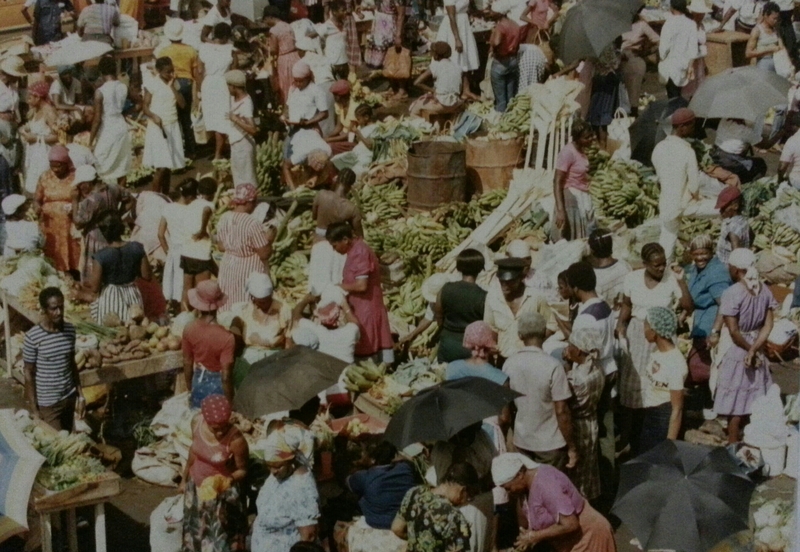 If we begin here, with a photograph like this; with an agorá not so far removed from our contemporary cultural memory; a market scene bustling a year after Maurice Bishop, Unison Whiteman, Norris Bain, Jacqueline Creft had been executed with others at Fort Rupert (now Fort George); after a revolution had failed; a year after that failure was compounded by the presence of US troops; after Bishop’s body disappeared along with the dream of a Grenada that should have been, what do we find, and where do we find ourselves? Hard to say, but the good thing about reflection is that it endows us with the benefit of knowing that context is not subject to the constraints we set for ourselves. Time spent reflecting is not a waste. I’m no expert on the Revo–that should be clear enough. In fact, my primary concern is not the Revo as such but the people themselves, the ones we see and those we do not see but know were there. The ones who heard about it. Those who forgot it even happened. I don’t need to be an expert to know everyone was touched. You see where I’m going with this. There’s a special kind of violation that comes with being touched and not knowing about it–a special kind of denial in appearing not to. I won’t go on. There are many questions that can come up in the course of our examinations of images, archives, and texts we have at our disposal. I recall Merle Collins, who reminded us at her lecture that Grenada’s story is not only Grenada’s story but the story of the entire Caribbean. (I’d like to push it even further to include all marginalized people.) She was right, of course. So look at the photograph (or one of relevance to you for whatever reason) and ask: Who do I see? And who, among those I see, do I recognize? Do I recognize anybody in it who is still alive? What can they tell me now? What other questions do I have about what I see? What other images can I locate–under the bed, in a box, a dusty album, the forgotten pictures of forgotten people–to do this kind of work? Think about it. Write about it. Make an agorá of your own and invite others in to visit, to buy and sell, to share and learn. Share. Learn. We are in need of answers. Seriously, this is one of my favorite captions. I don’t know who this is. 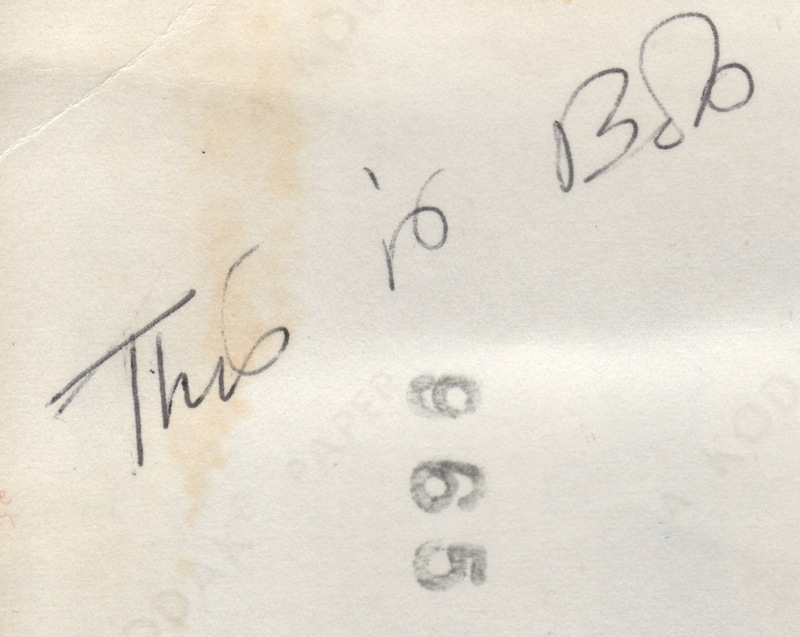 I mean, it’s Bob, of course, according to the note on the back of a photograph I found among other photographs. Despite my inclination, I am unwilling to ask the usual biographical questions about Bob. This is not for lack of interest but because I’m fascinated by the inherent tension between memory and mystery. It seems to be my mother’s handwriting, though she seems to have forgotten about him–far less about his whereabouts. This was Brooklyn in the 60s, a couple decades well before she came to New York. November 3, 1985. A Sunday. I’m sure if I were to press her enough for information, recollections of Bob–however brief or extensive–would come back. You know how it goes, don’t you? Bob. He whistled better than he sang. He didn’t like ties or black suits. He liked jazz, though. Frankie Beverly and Maze. Yes. Mongo Santamaria’s 1959 Afro Blue. Yes. He felt you’d be crazy not to love that. Love the Oscar Brown, Jr. version, myself–burned it onto a CD for a lover a few years ago, along with Mighty Love and some other classics. She loved it. I loved her. She cut herself pretty badly trying to dice onions, and I helped calm her down when she saw her blood and panicked. Then we ended and walked away without much fanfare, anger, or love. It’s tempting to wonder if that was Bob’s fate, or my mother’s–tempting to add layer upon layer of speculation on them both. It makes a certain kind of sense, I think, because even with other people’s stories, I am not inclined to reproduce something I consider boring. I almost want Bob to be as cool as he looks, hanging out with Mozart’s bust. He didn’t like ties, remember? And yet, I am not inclined to follow this course too deeply. Yes, my aspirations to creativity can, at times, take precedence and encourage me to dream–even if those dreams are stated poorly. But there’s also a subtle pleasure in taking Bob–whatever he is–as he is, without the overlay. This must be applied to every archive with the diligence of a historian. Still somewhat presumptuous, there’s a respect for Bob that, to me, outweighs the need to make stuff up about him, the need to have “my slumbering fantasy assume reality,” as Oscar Brown himself would put it. Afro Blue. For, as complex a web of imaginings as I can construct, my feeling is that it will result either in my own entanglement or my readers’ confusion–neither of which I desire. So I have to stop, take a breath, lift my fingers off the keyboard, and look more honestly (if not knowingly) at what I see. This is the case with any archive: whatever its story, it will come only in the context it alone can provide. Whatever path it–or any archive–sets me on will begin with what it alone can suggest. Now to begin again. This is Bob. He stands, a black man paling in comparison to the heroic scale of Mozart’s bust, in contrast to his pale suit and white shirt. The piece, sculpted by Meuller, and presented as a gift to the people of Brooklyn, neither sits nor stands. He’s of average height, even in Mozart’s shadow. This makes him normal by default. Bob trains his gaze toward the pagoda. Perhaps he ignores the photographer, or is directed to do so. There is an implicit discomfort in his pose, as he leans forward a few inches lower than seems natural. He manages to pull it off, suggested more by the apparent absence of discomfort on his face than the awkwardly angled pose of the body (to which the comfortable face belongs). Normal and immortal, like the Ozymandian block behind him. I suppose, in a way, I almost want Bob to be a mystery because I find that something profound occurs when we encounter actual physical evidence of that which is, in spite of what we see and can touch, unknown. But maybe the mystery of Bob, or the idea of a memory of him that I do not possess, tells me more about myself in the end. Basic stuff, like: maybe I still hold on to the wonder of not knowing something, in spite of my personality and professional training. 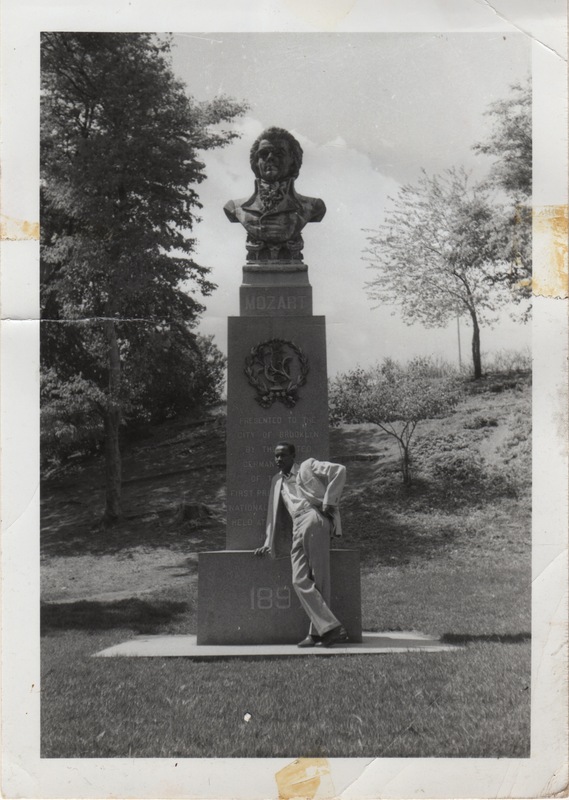 Maybe I like the idea of thinking about Bob, aging at the same pace as Mozart’s bust, standing fully embodied, taking in the unknown goings on of a Prospect Park afternoon in the summer heat. I’m just vibing, here–riffing a little bit, but not entirely lost in the question if who he is, resting instead in the fact (proven by this image) that he was–and was here. So, to begin again. This is Bob. Ask any writer, any arranger of words, images, sound, or any of those combined, and you will hear that what we do is hard. Not for the faint of heart, pen, fingers, etc. My colleagues and friends and students will readily attest, as will my Mom. As will I, for that matter. Despite a few decades proving the contrary, many still seem to think that the text emerges already polished from the mind of the writer whose intelligence, sophistication, and experience have all cooperated on the writer’s behalf (and conspired against the student/writer who, once assigned to write on this or that matter of crucial import, must now struggle to do so at the risk of grades and the like). My sympathy is there–with the struggling writer–because as a writing teacher, I have had both cause and occasion to consider my own process–though, only to minimal effect. Nevertheless, as part of that consideration, I’ve realized that I’ve taken a number of things for granted–specific to my point in this post, I’ve taken for granted the fact that all the texts I produce have meaning in terms of conception, methodology, and practice. I don’t know why I’ve let that fact slide, especially when knowing, and acting on what is known, is at the heart of my work and of my conception of what we do as vernacular practitioners of every life. Have I forgotten that I intend to practice what I…theorize? No. Have I decided to recant and start anew with an idea that what we do amounts to nothing? No. Is it an internal contradiction I’ve yet to resolve? I don’t think so. Me and my demons are good. The reason is frightfully mundane, I’m afraid: I got caught up. Doing things. Living. Trying to make ends meet. Simple as that. Funny, I imagined this admission with a bit more flourish. I could try restating, but no. I’m continuously revisiting the latter parts of this circuitous path that I took to get to it. The book didn’t just happen–couldn’t just happen. These early articulations–the semi-literate scribblings in notebooks–ought not be relegated to the nether regions of untapped memory, dry-rotting in the mind like an unkept artifact. My idea is to posit Cbean rhetorical forms as the sine qua non of the superisland ethos. Everything we do is a placeholder for another work-in-progress. Grampadaddy: a name ah make up when ah was a youth. There are no theories about that. Anyhow, ah dey playing with de camera and end up adding a “magic pen” effect to de picture. And then Boom. Meh fascination with he hand finds its roots where most fascinations do: with things that strike the fancy, stir the imagination, but are hardly ever known. Those mysteries that form the parameters of your life, providing the yard for your consciousness to go and play around in without the risk of getting lost–well maybe a little lost, but not entirely. It have a poem inside here fuh meh to write, eh, buh it ent come yet. Ah hatuh wait on it. In de meantime, ah thinking. Thinking bout home. Thinking bout which one ah dem vein ah come from. De poem coming. Ah coulda even kinda hear it jumping up inside meh head. Then again, was carnival season. Christmas did just done, and the speakers and them by the bars and them turn up loud. The rhythms can deceive yuh. Yuh could get lost in them. The urgency of finding a way. The implicit contingency of making a way on your grandfather’s veins where there seems to be no other way, at least none you could see on your own. On top of that will probably come a more carefully crafted consideration of symbols, their actions, and the inherent tensions between their metonymic aspects and their metaphoric ones, the dynamics of composition–de degree to which this or that is embodied or is simply meant to evoke the body, mine or his, or whomever’s, as well as…etc., etc. That will come because it must. Because that is what I do. It’s kinda my thing. 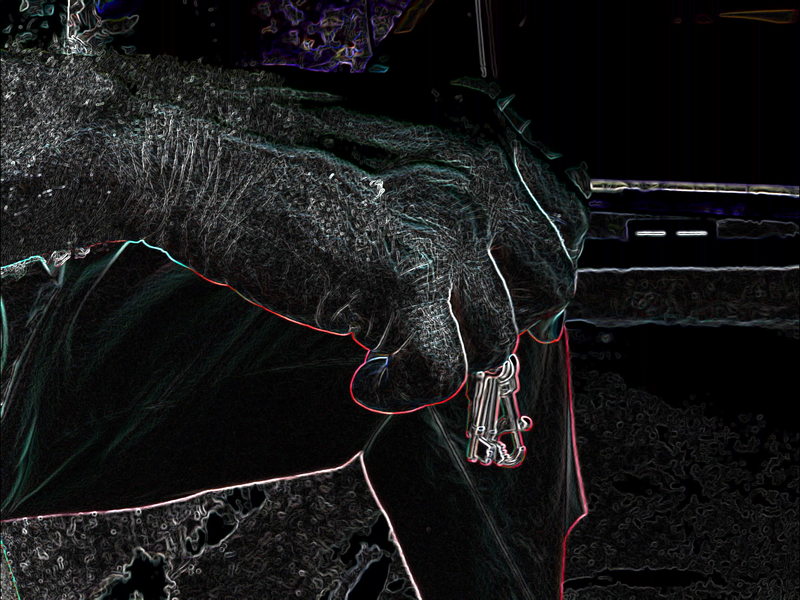 Fuh now, though, is only this hand, with some keys, digitized to show the veins. And I good with that. It is this simple: I want to be remembered. 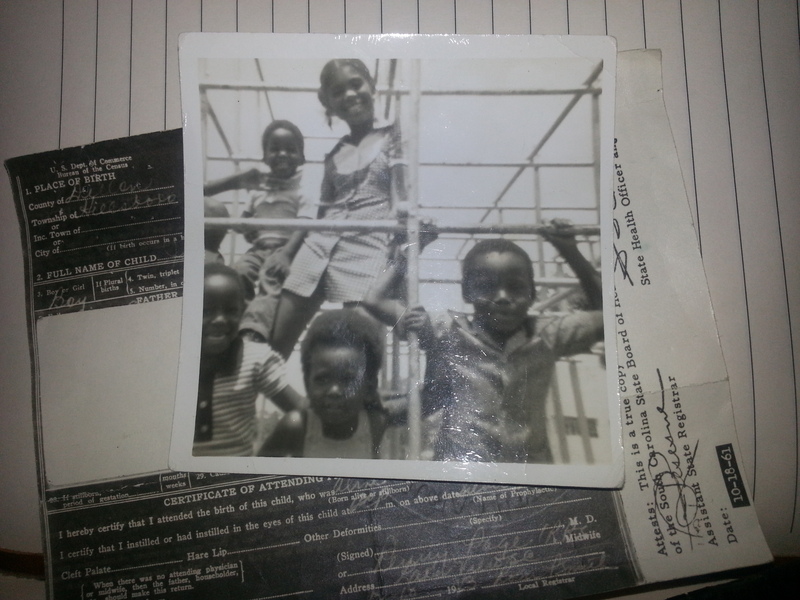 I look at this picture of myself and my cousins–Leonel on my right, Dionne to my left, Rhonda behind me, and Noel behind her–and feel sad that my nostalgia for other things is not as effective here. It shouldn’t be like that, but this is what it has come to. It’s tempting, of course, to opt for the obvious symbolism as I grasp at straws for a language to explain what I mean. Symbolism, a domain I frequent. The matrix stands out (but, truthfully, it can scarcely receive more of a mention than this, reserved mostly for this or that conclave of skeptics and cynics with whom I tend to keep company from time to time). It’s enough to say that the framing was deliberate–perhaps as deliberate as the steel frame that taught us too well about gravity and texture. But this is how temptation works, I suppose. So it’s best to take it in stride. The sadness is a trump card, though. A far better frame for my regrets, for things I miss and have missed. Funny how the regrets pile up in proportion to what we have not done, rather than the alterations we think we’ve made to history. No such luck, we find out. Often too late. What happens then? When, having been put through the ringer, we come face to face with the stark limitations of an “all-too-humanness?” Hard to say conclusively, but (for me, at least) I turn to words. There’s a prophecy embedded somewhere in that: “turning to words.” A possible transformation. A wish. A story coming to pass (because, as the people say, What ent meet yuh ent pass yuh). So here it is: a project on a conception of the self whose beginnings are etched out in public, like an idea that through practice calls itself into account.